Cabin crew are only human; sometimes they go above and beyond the call of duty, but occasionally a darker side emerges – and two recent examples of in-flight behaviour by female flight attendants demonstrate the two sides. 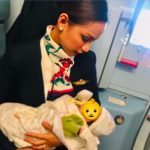 On the side of the angels, a flight attendant on a domestic Philippine Airlines flight noticed that a mother on the flight had run out of infant formula to feed her baby. 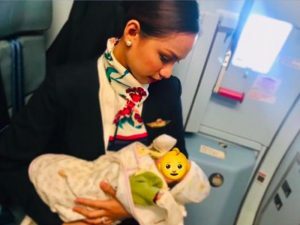 As a first-time mother, flight attendant Patrisha Organo, 24, offered to breastfeed the stranger’s baby. “I heard an infant’s cry, a cry that will make you want to do anything to help,” Organo wrote in a Facebook post that showed her cradling the child. Organo describes herself as a breastfeeding advocate and has a nine-month-old baby at home. On the darker side, two female American Airlines flight attendants are headed to US federal court after one accused the other of dragging her down the aisle of an aircraft by her uniform scarf. Both women involved are Texans, from different cities. The alleged victim says the airline failed to investigate the incident and is seeking up to USD 1 million in damages, alleging negligence, dangerous work environment, breach of contract, assault and battery. The Dallas Morning News reports Kathy Ida Wolfe filed suit against Laura Powers on 9 November 2018, alleging that Powers “maliciously dug her fingernails into my arm, and slammed the door of a beverage cart on my arm” during a fight in June 2016. Wolfe contends that she reported the attack to the captain, as procedure demands – and also to her fellow cabin crewmembers and to the flight service manager – but she says the airline failed to properly investigate the incident. “I also reported the assault and battery to legal authorities after American Airlines failed to investigate and/or take action to ensure my safety,” Wolfe said in the lawsuit. Powers and American Airlines have each filed a reply to the lawsuit saying they are “not liable because Plaintiff caused or contributed to cause the harm for which recovery of damages is sought”, reports say. If it had been a QF flight, the child would have been allowed one breast, but company policy would not have allowed a second breast unless the infant was in Business Class.